Investing in Cannabis | Excerpt Pot, Inc.
With a well-deserved reputation as a hot and burgeoning industry, promising high returns in the medium to short term, marijuana is attracting countless investors. But as with any other sector with such an outlook, investing in cannabis is not for everyone. At least, not for everyone who does not have the right information. Just like opening a medical marijuana company requires an interest in the sector, investing in legal cannabis is not an obvious choice for just any investor. Yes, 30 U.S. states have legalized medical marijuana (as of August 2018), and we have large fortunes and well-known CEOs entering the cannabis space1, but these are people and financial groups that have done their due diligence. In order to survive the many ups and downs that await along the way, investors must really understand the business. Only thus will you be able to reap its succulent rewards. With medical marijuana already legalized in Mexico and Canada on the brink of legalizing recreational use of the drug, North America is becoming an increasingly fertile ground for cannabis-related businesses and investments. Billions of dollars will be spent on all manner of medicinal and recreational cannabis in our region over the next few years. And, of course, investors have followed suit, finding numerous ways of fuelling capital into the industry. Another aspect to look at is whether the grower is diversifying, focusing on products such as oils and cosmetics. Finally, because marijuana cultivation falls into the intensive category, you would want to invest in a company that uses a system that maximizes the efficiency/cost equation. One less frequent type of investment involves buying shares of companies dedicated to the branding and marketing of all manner of marijuana-based products. In the coming years, this will become a huge industry. Because regulations regarding packaging can be challenging, these companies need experience and efficiency, and the ones that actually produce the cannabis need them like air. The particular expertise required for the business has often yielded excellent results. For example, Kush Bottles, which focuses on helping growers ensure packaging and marketing compliance in both Canada and several U.S. states, has seen a spectacular 173 percent increase in its third quarter revenue for 2018, compared to the same period in 2017. This brought total Q3 2018 revenue to a sizable $ 12.9 million, up from $4.7 the previous year.3 Kush currently caters to over 5,000 pot companies across the planet. Dispensaries are a more obvious path to choose as an investor. For many market experts, one of the best choices right now is MedMen Enterprises. In mid-August, 2018, the retail pot business announced $19.2 million sales for their most recent quarter,4 surpassing sales for the whole of 2017. The spectacular growth is attributed to the opening of the recreational market in California. MedMen also had its debut as the largest marijuana stock on the Canadian Securities Exchange last May. Revenues for the company were catapulted by 760 percent when comparing the average quarter between the second half of 2016 and all of 2017, with the last quarter of 2017. During that period, seven of the company’s top dispensaries attracted over 90,000 customers. The average spending per customer for the last quarter of 2017 was a sizable $77.76. For MedMen’s CEO Adam Bierman, "Retail is the key to the fast-evolving cannabis industry. It is where brands are built and where the margins can be maintained... The rapid revenue growth in our California stores, only six months into recreational sales, is a solid reflection of our continued execution of our business thesis. "5 By 2020, MedMen plans to operate 50 upscale dispensaries. In line with these projections, MedMen presents itself as, “one of the nation’s largest financial supporters of progressive marijuana laws.” In fact, it has launched a magazine with the aim of dispelling stereotypes about pot smokers. With images of young, popular Hollywood actresses discussing marijuana and parenting, and a healthy lifestyle vibe, the publication, which is called Ember, is well-poised to expand the market and advance the cause of legal recreational marijuana. Appointing Jay Z’s Roc Nation CEO Jay Brown to MedMen’s board has been a rather smart move in the same direction. Although MedMen is doing especially well, they share their good industry standing with hundreds of dispensaries that have been well-positioned in states like California and Colorado for years. In other words, MedMen is not the exception, and we are going to see many dispensary stocks experiencing interesting jumps in the coming months and years. The FDA gave its first approval for a cannabinoid-based drug in June 2018. With scores of peer-reviewed papers highlighting the benefits of cannabis for numerous conditions, including epilepsy, chronic pain, and cancer, it is easy to predict that the rate of approval of this type of drugs will keep rising in the near future. The marijuana streaming business is booming right now. Based on familiar streaming models, these companies help local marijuana growers and other pot-based outfits expand their capacity, secure financing, and better market their products. The funding providers then collect royalties from their clients’ sales. Because streaming companies focus on making deals and not the actual production, they have small overhead costs; they simply make pot companies more competitive and reap the high-margin returns. The first royalty marijuana stock to go public was Cannabis Wheaton, now known as Auxly Cannabis, and still today one of the industry’s safest bets. As of July 2018, Auxly was valued at $442 million, which placed it among the top ten largest marijuana stocks. Tidal Royalty Corp (total shares valued at 153.6 million) has helped position some of the top cannabis companies in Canada and elsewhere. Its CEO, Paul Rosen, is one of the emerging industry’s most dynamic investors. A former president of The Cronos Group, Rosen brings great expertise and foresight into a company that will continue to grow by providing funding for promising pot producers. Companies that offer hydroponic solutions are currently experiencing growth due to rising demand for larger quantities of cannabis plants. Hawthorne Gardening (a subsidiary of Scotts Miracle-Gro) has thrived by offering a variety of hydroponic solutions to help cannabis growers boost production. As per Scotts’ latest update on the Fiscal Year 2018 Outlook, Hawthorne’s sales will experience a 25-30% for fiscal 2018, as a result of the recent acquisition of Sunlight Supply. As an investor, you should always be on the lookout for companies that, while not directly involved in the cannabis business, may greatly benefit from booming sales and increased production. Another big player that has recently benefited from the growing legal cannabis market is Cree, Inc., a manufacturer of high-efficiency lighting systems used in marijuana cultivation. The High-Pressure Sodium lights commonly used in the industry have a high cost. Cree’s LED lights are much more cost-efficient, producing less heat and requiring less AC power. Companies like Cree do not even refer to cannabis in their long-term strategy communications, but they may certainly stand to benefit greatly from the spread of legalization across America. If you want to invest in a diversified portfolio, you may choose an ETF with positions in a variety of cannabis stocks. With some related ETFs reporting yields of 50 percent for the last year, it’s easy to see how this option might be popular. Horizons Marijuana Life Sciences Index ETF, the first to enter the market and the largest to date, boasting C$ 726 million in Assets Under Management by March 2018. Horizons Junior Marijuana Growers Index ETF (HMJR.TO), smaller but diversified and promising. AUM: $15 million. ETFMG Alternative Harvest ETF creates opportunities for Americans to invest in Canadian and other international cannabis stocks. Formerly a Latin American real estate fund, it boasts an AUM of $400 million. Redwoods Marijuana Opportunities Fund. Based in Canada, it manages C$7 million in assets and was the first marijuana ETF to allow fund managers to use long-short strategy. As of August 15, 2018, Constellation Brands, the maker of Corona beer, decided to pour an additional $4 billion into Canadian marijuana company Canopy Growth.8 The move takes Constellation’s stake in Canopy from the original 9.9 percent to a much more significant 38 percent. The announcement led to a 30.4 surge in Canopy stock. Constellation might launch a cannabis drink in Canada in 2019, but will likely wait for cannabis to be federally legalized in the U.S. to commercialize it nationally. Molson Coors' Canada is also planning to market cannabis drinks, in this case through a joint venture with marijuana producer Hydropothecary. Coors will maintain a 57.5 stake in the new endeavor.9 The beer company’s shares rose 3.5 on the market following the joint venture’s announcement. While the industry is very dynamic and stocks can be volatile, a snapshot of a given moment in market performance can be quite revealing. During the period of reference, August 3, 2018 - last five trading days, some top shares experienced slight drops, including Canopy, Green Thumb, and GW Pharma. iAnthus Capital, which recently announced plans to upgrade cultivation facilities and open dispensaries across the U.S., has yielded 131.07 percent returns over a one-year period. On the other hand, GW Pharmaceuticals, which dropped by about 6 percent over the last days of July and first days of August, has actually yielded a healthy 36.17 percent over the last year. 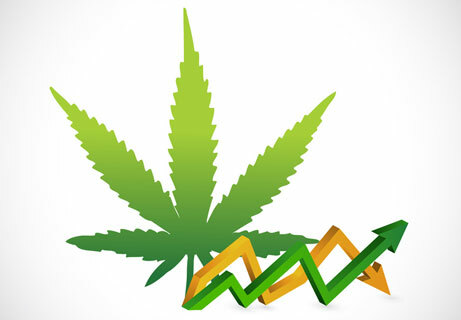 In spite of their ups and downs, the top cannabis company stocks are experiencing an upward trend in the medium and long-term. Between 2014 and 2017, medical cannabis sales have more than doubled, reaching $6.7 billion for the last year. Spreading state legalization has opened massive markets in the U.S., and several countries all over the world are following suit. To understand why sales are plummeting, one only need look at the data for medical marijuana vs. recreational marijuana sales. Now a lot of people who were using medical marijuana for recreation are now migrating to the recreational market, wherever this has become legal. When 2018 data comes in after the close of the year, we will see just how much the recreational cannabis market has expanded. California’s legalization of pot-for-play is one of the main causes of the shift in the U.S. Canada is another huge market that will have legal recreational marijuana at the disposal of consumers starting in October. Now, if investors were suffering from the decline in medical cannabis sales, we might be facing a catastrophe. However, medical marijuana companies have been quick to adapt to the changing scenario, diversifying to access the new market. The top North American cannabis companies have already planned an expansion to be able to cater to the adult recreational user. Canada’s Aurora Cannabis, for example, has acquired numerous entities to boost its capacity to prepare for the expected recreational pot demand. The cannabis market is definitely growing, but these changes, especially those relating to the legal framework, may cause some stocks to be risky in the short term. Cannabis-related developments can be predicted, to a certain extent, but an awareness of both micro and macro shifts is essential to keep your portfolio profitable. The complex dynamics of the legalization process has caused fewer companies to be publicly listed in the U.S. stock market. Many, in fact, have chosen to go public in Canada instead. 2018 was an important year for cannabis stock, as it saw the first companies listed on NYSE and Nasdaq, these were the Cronos Group (Nasdaq) in February and Canopy Growth Corp (NYSE), in May. The reason NYSE and NASDAQ allowed these companies to list is because their business is carried out in Canada, where cannabis is legal, nationally. Many cannabis companies are currently penny stocks traded in Over the Counter markets. Of course, OTC markets do not have such strict disclosure requirements as established stock exchanges, which makes investments appear riskier. In a young industry that is creating its own rules along the way, it is sometimes hard to decide where to place your bets. In a recent webinar, the editor of Green Markets Report explained that the NYSE features some “less than stellar” cannabis stocks, and the OTC markets do not only list “sketchy” stock.11 In fact, the particular stage the industry is going through has caused some companies that could well list on Nasdaq to trade over-the-counter instead. Cannabis companies that listed auspiciously on Nasdaq have taken an unexpected fall on occasion and some companies listed on reputable exchanges have experienced a spectacular surge in share pricing, but have no revenue to speak of, which makes them a rather risky play. Since Canadian banks are willing to work with cannabis companies, Canadian exchanges are one of the prime spots to trade marijuana-related shares. At a certain point, though, the Toronto Stock Exchange said they didn’t want to list companies doing business in the U.S., where cannabis is not federally legal. On the other hand, the Canadian Stock Exchange has decided to allow U.S. companies to be listed more freely. Aside from the trading platforms mentioned above, the Toronto Venture Exchange is another possibility for finding cannabis stocks in our neighbor from the North. The marijuana sector is extremely dynamic and competitive. Companies with a great business plan, expertise, and an eager consumer market at hand, need fast access to capital. For companies like Green Thumb (millions of dollars in cannabis revenue from various states) and Oregon’s successful Chalice Farms, the possibility of listing publicly in Canada has been a game-changer, allowing them to expand fast enough to meet the market’s voracious demand. For the founder of Chalice Farms, the U.S. banks’ reluctance to take their cannabis business is frustrating. “The people have spoken. We voted for this. Allow the banks and the investors to get on board,” he has commented. Does the company's business involve touching the plant or not? This has many legal implications, especially for the U.S. market. Do you want to invest in medical, recreational, or both? Are you comfortable with Canadian stocks, OTC, or only U.S. stock exchanges? What is the sector that interests you the most? From pharma, retail, ancillary businesses, and streaming, to software and agriculture sector companies, there is a lot to choose from.